Ralph M. Hall, representing the Fourth Congressional District in Texas, was first elected to the U.S. House of Representatives in 1980 and has been re-elected to each succeeding Congress. 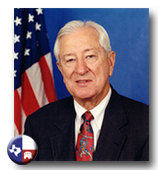 Congressman Hall was selected as Chairman of the Committee on Science and Technology for the 112th Congress. Between 1950 and 1962, Mr. Hall served as County Judge of Rockwall County, Texas. In 1958-1959, he served as President of the State Judges and Commissioners Association. He served in the Texas Senate from 1962 to 1972, where he served as President Pro Tempore in 1968-1969. Ralph M. Hall was born in Fate (Rockwall County), Texas, on May 3, 1923, attended the public schools in Rockwall and graduated from Rockwall High School. He joined the U.S. Navy on December 10, 1942, serving as a lieutenant (senior grade) aircraft carrier pilot from 1942 to 1945. Hall attended Texas Christian University, Fort Worth, in 1943; attended the University of Texas, Austin, 1946-1947, and received his LL.B. from Southern Methodist University, Dallas, in 1951. He was admitted to the Texas Bar in 1951 and maintained a private law practice in Rockwall for many years. In 1944, he married the former Mary Ellen Murphy. They have three sons, Hampton, Brett, and Blakeley, and five grandchildren.